Jyväskylä is a city and municipality in Finland and in the western part of the Finnish Lakeland. Kick off your visit on the 14th (Sun): take in the architecture and design of University of Jyvaskyla, tour the pleasant surroundings at Maki-Matin perhepuisto, and then test your team's savvy at popular escape rooms. Make your Jyvaskyla itinerary with Inspirock to find out what to see and where to go. Helsinki to Jyvaskyla is an approximately 3-hour car ride. You can also take a train; or fly. Traveling from Helsinki in April, you can expect nighttime temperatures to be little chillier in Jyvaskyla, with lows of -3°C. Wrap up your sightseeing on the 14th (Sun) to allow time to drive to Oulu. Oulu is a city and municipality of inhabitants in the region of Northern Ostrobothnia, Finland. On the 15th (Mon), tour the pleasant surroundings at Nallikari Beach, then look for all kinds of wild species at Hupisaaret Park, and then stroll through Ainolan Puisto. For traveler tips, photos, where to stay, and other tourist information, refer to the Oulu trip maker website . You can drive from Jyvaskyla to Oulu in 4.5 hours. Other options are to fly; or take a train. In April, daytime highs in Oulu are 5°C, while nighttime lows are -3°C. Cap off your sightseeing on the 15th (Mon) early enough to catch the train to Rovaniemi. Kick off your visit on the 16th (Tue): get in on the family fun at Santa Claus Village, enjoy some diversion at Santa Claus Office, and then find something for the whole family at SantaPark - the Home Cavern of Santa Claus. On the next day, look for all kinds of wild species at Wildlife Areas, then get engrossed in the history at Arktikum, and then make a trip to Lordi's Square. 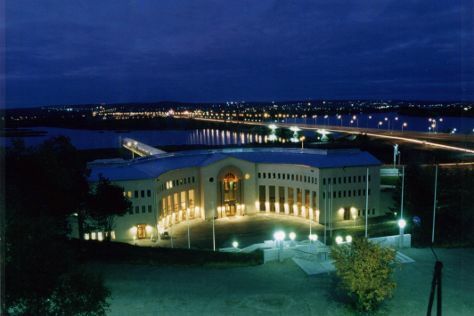 To see reviews, more things to do, and other tourist information, go to the Rovaniemi travel itinerary planner. Getting from Oulu to Rovaniemi by train takes about 2.5 hours. Other options: take a bus; or drive. In April in Rovaniemi, expect temperatures between 3°C during the day and -3°C at night. Wrap up your sightseeing on the 17th (Wed) to allow time to travel back home.